It’s true. I have totally eaten like crap lately. My diet is terrible. Sonic cheeseburgers are as much a part of my routine as exercise is supposed to be. The order is always the same. A junior double cheeseburger with ketchup and without the pickle, and a medium iced tea with a shot of lemonade, easy ice. Most of the time I stayed home and waited, but sometimes I would go with a caregiver to pick it up. My summer of Sonic. Comfort doesn’t come close to the feelings of satisfaction I had after the carhop came to the window and I took my first bite. I didn’t tell anyone my secret (except for the caregivers who would drive to get me the aforementioned meal all the time.) The total was $4.34. Sadly some parts of my routine are totally predictable. I am definitely not proud of the fact that I ate food from Sonic all summer. Just suffice it to say that I often drowned my guilt in the grease of a cheeseburger. Have you tried the chili cheese tater tots?And did you know they have mini sizes of all their sides now, so they hardly have any calories at all? Half price shakes were after 8 p.m. Their waffle cones are really good too, especially with hot fudge and toasted pecans on top. I’m sorry, what were we talking about? You know what happens when you eat crap all the time? You start to feel like crap. It’s amazing how that happens, isn’t it? My workouts have been sporadic since I completed the Marathon Parallel Bar challenge in August, and my body has been feeling it, so a few weeks ago I promised myself something new. I like the concept of the 100-day challenge. I heard about it a few years ago. Basically, the idea is that if you want to learn something new or start a healthy habit, you do something to consistently make progress for 100 days. I have seen YouTube Videos of people who take the challenge to learn to play the piano, practice kindness, become a better artist or a million other things. Many people do it because they want to get in better shape, like me. The theory is that after 100 days, whatever you wanted to do is incorporated into your life. I like the amount of time because it is long enough to make real changes, but it doesn’t feel like a lifetime. If I want to do something different after 1oo days, I can absolutely do so. We will see where I am by then. The challenge is here. 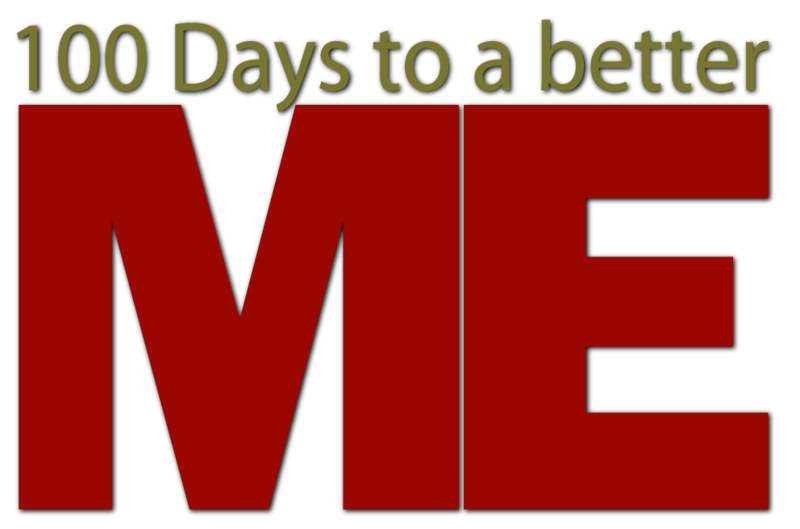 For the next 100 days, I am not going to eat fast food and I will eat as much whole non-processed food as possible. My primary goal is to feel better, so I am not going to get a “before” weight. I have a pretty good idea of what I weigh now and the total amount of weight I would like to lose eventually. I am not exactly sure what realistic expectations for this time frame are, but I am more concerned about starting to eat more healthy and heading in the right direction. I also plan to start doing laps again, use my exercise machines, and start lifting weights again. I will drink at least 96 ounces of water and do something physical for at least 30 minutes a day. Since I am a wheelchair user and live a fairly sedentary lifestyle, most of my results will likely come from changing my diet. I will keep everyone posted on my progress. Day one has gone well so far. Lots of sauteed veggies and quinoa and they were delicious! I’m psyched. I feel like the theme song from “Rocky” should be playing in the background for some reason…Yo Adrian! Wish me luck! Only 99 days to go. This entry was posted in 100 day challenge, Beginnings, caregivers, exercise for people with disabilities, fast food, Starting Over and tagged #disability and exercise, #healthy eating, cheeseburgers, Rocky theme song, Sonic. Bookmark the permalink.